Enoc Perez’s lushly figured paintings of modernist buildings at once exploit and question the seductions of architecture as well as painting itself. The exhibition presents two new bodies of work, one focusing on the Marina Towers in Chicago and the other a commissioned painting of the Watergate in Washington, D.C. These architectural portraits evoke modernism’s futurist aspirations as well as the sadness of an always-impossible ideal. On a basic level, Perez’s work is about painting: the pleasures of its translucent shimmer and viscous clots, the histories embedded in its play of figure and ground, and its ambitions to arrest time. However, little is traditional about his technique, which uses photographs and found imagery from postcards and magazines and which combines elements of brushwork with a sort of primitive printmaking. Perez makes a preparatory drawing for each color that will be in a finished painting, coats the back of the paper with oil stick, and then presses the image from the intermediary paper onto the canvas. This transfer process mimics the processes of mechanical reproduction while drawing upon conventional painting techniques. Perez harnesses this mongrel technique to probe the medium’s ability to reconstitute time and place, exploring how technology and memory create experience. Over the last 15 years he has sought out landmarks of the modernist style, tracing a map of the urban environment that is as much mental and social as it is physical. His painted city includes the Seagram Building and Lever House in New York City, the Eero Saarinen TWA Terminal at JFK Airport, and Casa Malaparte on the island of Capri, Italy. While investigating these structures as symbols of power, futurism, and utopian promise, Perez’s canvases, heavy with paint and physical reality, simultaneously return to them their corporeality. The Marina Towers series (2011–12), exhibited for the first time at the Corcoran, consists of eight renditions of Chicago’s skyscrapers, built in 1962. Echoing Claude Monet’s paintings of the Rouen Cathedral and Andy Warhol’s Marilyns, Perez obsessively refigures the architectural icon, shading his palette of reds, yellows, and purples according to mood and time of day. The works encourage intense, repeated looking at an object that is at once static and ever-shifting, compressing the arc of days and years into the confines of eight pictures. Perez will install a painting of the Watergate—the Washington, D.C., architectural complex built between 1963 and 1971—in the Corcoran’s Rotunda. Stretching across the gallery’s two rounded walls, Perez’s painting is a cloud of swooping curves and jaunty angles, made stark with a palette of blacks, whites, and grays. 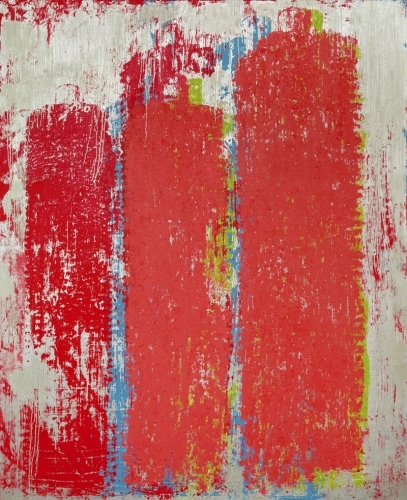 The intertwining of the painted and printed is here made apparent, as paint is pressed and brushed on top of a photographic image. The resulting work is cinematic in effect, surrounding the viewer in an experience that is inescapably redolent of the scandal that brought the building its fame.